Popping in on this short week with the most simple outfit ever… one I’m caught most in lately! 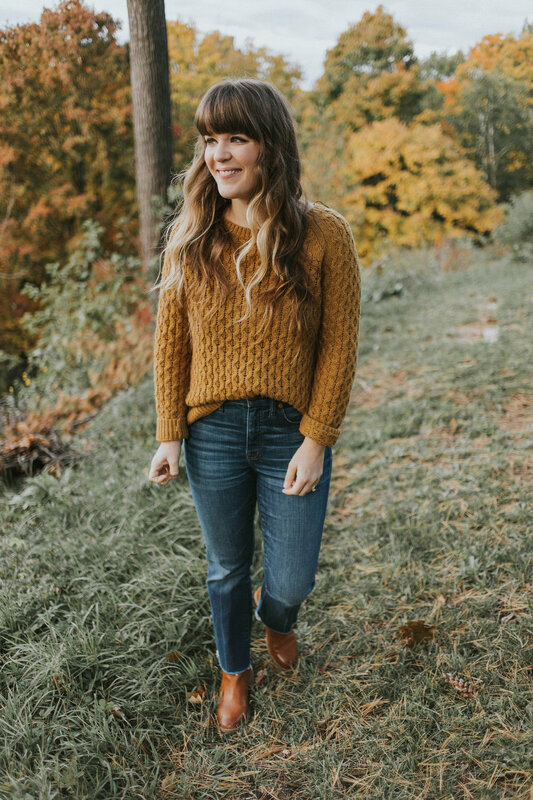 A favorite pair of denim, a cozy sweater, and a comfortable pair of ankle boots. I wore this for our road trip home in the car from up north. Road trips are just the BEST in autumn… the scenery is so pretty the entire way! This is the last from our trip to the Tunnel of Trees. I have a couple more autumnal posts to wrap up November, and then we’re moving into the holidays! It’s already snowed here twice, melted both times, and now we’re left with this gray transitional weather. I’m great with that until Thanksgiving is over, and then I want it to snow, snow, snow all the way to Christmas! I’ve been thinking a lot about how my style has really simplified (especially in the last year or so). I know that’s the biggest reason why people follow my blog/IG, but I’m also wondering if I should start to incorporate some of the other things I love. I mentioned something on IG about how I really love fitness, budgeting and organizing and someone commented that I should blog about those things! It’s just so easy to default into outfit posts because that’s what I know so well (and love) but I also just have so many other interests. So I’m going to try and finish out the year, and see what new content I can bring to this space in 2019. If you want to see anything, let me know! But I love budgeting, diet/fitness, home decor, cleaning/organizing, technology, beauty, photo/video editing, music, etc. There is so much more I could bring to the blog… I just need to push myself out of my comfort zone! I’ll pop in here one more time before Thanksgiving… and then I’ll probably be low-key over the long holiday weekend! We’re heading to Chicago for a concert, and to see family for Thanksgiving. After that, I’m hoping to chop down our tree, decorate for the holidays, start our Christmas shopping, and to relax and play all of The Sims 4: Get Famous this weekend. I just bought the expansion pack and to say I’m obsessed is an understatement. I’ve logged too many hours so far. Hahaha! Hope you guys have a great start to your week… and safe travels if you’re heading anywhere!